The OpenMobileNetwork is an open platform that provides approximated and semantically enriched mobile network and WiFi access point topology data published as Linked Data in RDF format. Since 2012, users from all over the world contribute to this dataset by running one of our dedicated Measurement Clients on their mobile devices. This crowdsourced data is used to approximate mobile network as well as WiFi access point topologies worldwide. The processed data is structured according to a comprehensive Ontology in order to provide information about base station and WiFi access point locations, their coverage areas, neighboring cell relations and dynamic data, such as traffic, service usage, and number of users. It is made available to the public through a SPARQL endpoint and a meta description is provided using the Vocabulary of Interlinked Datasets (VoID). In compliance with the principles of Linked Data, many interlinks to other Linking Open Data (LOD) Cloud datasets enable various applications ranging from Semantic Location-based Services to a sophisticated Power Management in Mobile Networks. 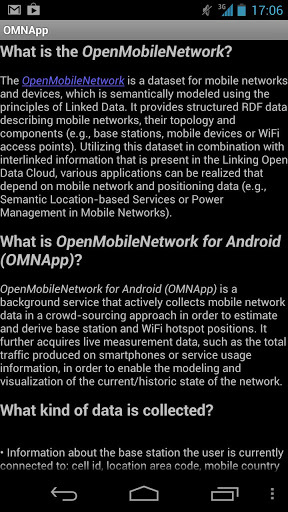 OpenMobileNetwork for Android (OMNApp) is a background service that actively collects mobile network data in a crowdsourcing approach in order to estimate and derive base station and WiFi hotspot positions. It further acquires live measurement data, such as the total traffic produced on smartphones or service usage information, in order to enable the modeling and visualization of the current/historic state of the network. 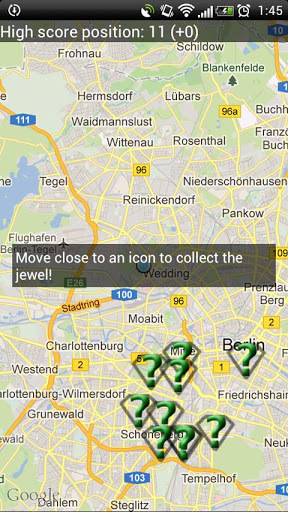 Jewel Chaser is a location-based game in which you collect virtual jewels by moving to locations in the real world. While you play the game, mobile network and wireless access point data is collected for the OpenMobileNetwork in order to enrich the existing database. In order to play it, just click on Start Collecting, check the map, and go towards one of the symbols shown on the map. 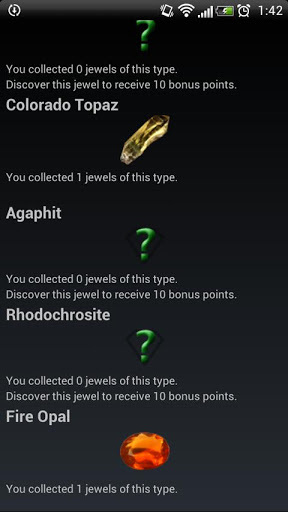 As soon as you are close enough to a jewel, it will be collected automatically. However, you need to have the map open in order to collect the jewel. This means you can check where the jewels are, close the app, and open it later again as soon as you are close to one of the jewels. In order to collect jewels, your GPS has to be turned on. At the moment, this dataset comprises data covering 59 countries all over the world. During the data collection process, 293,255 measurements for Cell-IDs and 1,781,324 WiFi access point scans were considered out of which we have calculated 13,966 unique cells and 161,614 WiFi access points. In Germany, there are 3,335 cells operated by Telekom, whereas Vodafone deployed 1,139 base stations. 1,979 cells are from the provider E-Plus, O2 has 1,376 cells. The cell coverage areas and neighbor relations have been calculated out of the raw measurements and are visualized on the OpenMobileNetwork Map. Currently, this dataset has 12,863,438 triples created for 13,966 cells with 1,353,916 links to several datasets of the LOD Cloud, such as LinkedGeoData or DBpedia.